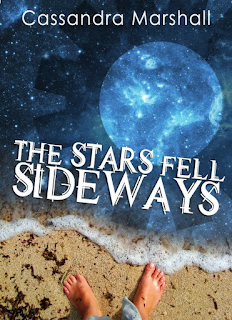 The Stars Fell Sideways-- Review and Interview with Cassandra Marshall! "Alison Arroway takes a lickin’ and keeps on tickin’. She has to, or she won’t get paid. Alison is a stunt double for pampered teen actress Pomegranate and when the director takes the shoot to Portugal, Alison is anything but thrilled to be rooming with Pom. But getting to hang around teen hearthrob Erik? Now that’s a plus. Erik invites both girls on a sunset boat trip and Alison manages to have a decent time. Until the storm hits and the boat is shipwrecked on a small island, leaving Erik missing and the boat captain dead. In the morning light, Alison and Pom find themselves on the lost island of Atlantis. Only one problem: now that the girls know the secret of the island, the Atlanteans don’t want them to leave. They're stuck with corsets, full-skirted dresses, and the strange steam-driven contraptions that are just a way of life for the islanders. When a plot by the ruthless army Captain to take over the island and declare himself General over all emerges, an underground group promises to return the girls to the mainland if they can help stop him. They'll go through a mountain, literally, to find the Book of Blue, a book that will explain how to make ‘the stars fall sideways' in order to save the day and earn their freedom." I enjoyed this adventure on a (light) steampunkish island of Atlantis. It was a light read, and a quick one-- the pace kept the story moving right along. I wish there had been a little more depth to the characters and the world (I enjoyed the unique people in a unique situation and wanted more! ), but overall it was a fun read! You can check it out here. And now, a few words from author Cassandra Marshall. What was the spark that started The Stars Fell Sideways? I'm sad to say I don't remember :( I did a thriller-ish contemporary for NaNo '10, right before writing this, and wanted something completely different. What the spark was though, I have no idea. What did you enjoy most (or least!) about writing the book? I really loved that friends of mine kept bugging me for more pages! Have that sort of accountability was great! Which of the Atlantean cities in the book would you want to visit most? I like making things, so I think I'd like to visit Hazzot and see all the things that are unique to the island and how to make them. But I bet Aeddlist has one heck of a view... and Scale does have canaries and I think having a canary would be fun too! Across The Universe, The Age Of Miracles, Life As We Knew It, The Giver, A Separate Peace, and of course, Harry Potter! Probably sharing the news with my local library! They've been super encouraging and are planning a book launch/signing party for me! And, just for fun, if you could invite one character from any book/movie to Thanksgiving dinner, who would it be and why? Hermione Granger! I'd listen to her tell facts and stories about Hogwarts all day long! And now to you, my friends! What fun books have you read lately? 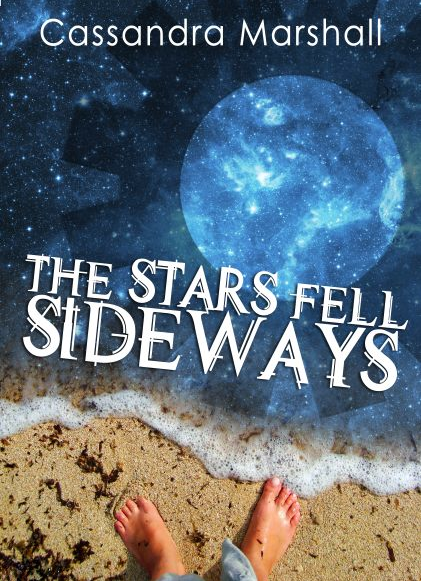 Love the title 'The Stars fell Sideways.' The premise is intriguing. I've always been intrigued by Atlantis. I love the title and it was great getting to know Cassandra. Love the cover and the title. And it sounds like a book I'd enjoy reading! I'd invite Hermione, too! I think the setting for this is great. Thanks for the rec!